Now that school is back in session the first thing on our agenda in the PTO was fundraising, and what better way to earn money for our schools (or church, charity, or military unit!) than bake sales! I love baking so any excuse to try a new recipe is good for me, and if it helps a cause near and dear to my heart all the better! When I participate in bake sales I always do cookies or brownies-they are usually the most popular bake sale items and you can sell them individually or in small portions. I find people are much more likely to pay $2 for 3 cookies than $20 for an entire cake! 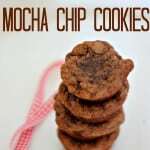 I also like to try new recipes that are a little outside oft he box-everybody loves chocolate chip cookies but what about Chocolate Mocha Chunk Cookies? Sounds intriguing, right? Cream together butter, hazelnut spread, brown sugar and granulated sugar. Reduce the speed of the mixer and add in flour, cocoa powder, McCormick Coffee Extract, baking soda, baking powder, and salt. Chill dough minimum one hour, preferably overnight. Drop 1 tablespoon of cookie dough onto baking sheets and bake for 13-15 minutes. Be sure to visit my team members’ bake sale posts at The Country Chic Cottage, Mom Endeavors, Stockpiling Moms and MOMables! « Thrifted Planter Makeover and Why You Need Houseplants! previous post: Thrifted Planter Makeover and Why You Need Houseplants! I copied the recipe Melissa! It just so happens that I’m responsible for a Bake Sale this Friday for our library’s fundraiser and I think these will be a big hit! Yummy!! I love that it has coffee and spread in it!! Thanks for the recipe!! 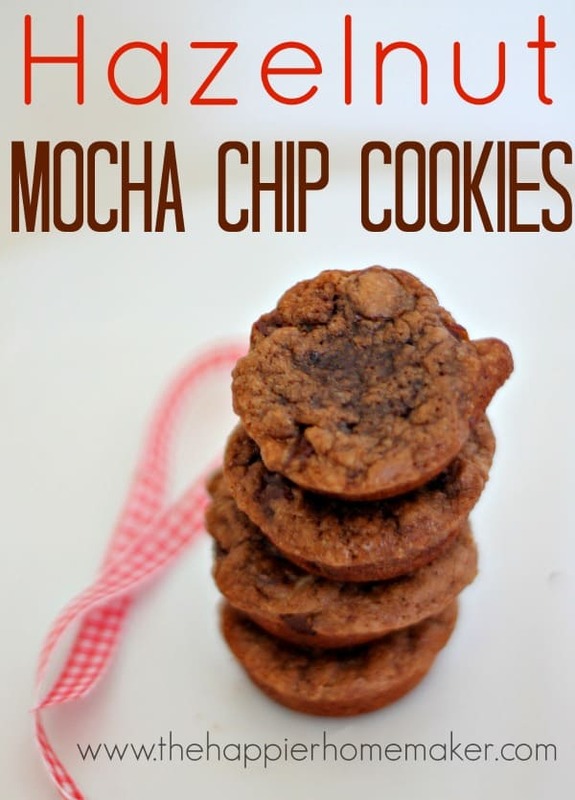 Hazelnut and Mocha Chips in one? Ummm…yes please! So yummy! Mercy….these are fantastic! I read this recipe a couple of weeks ago and tried it last weekend and we were in heaven eating them warm from the oven. I baked half the dough and got about 2 dozen cookies. I rolled the other half into rounded tablespoon-sized balls (about 2 more dozen) and froze them as an experiment. Today, I popped 2 of the frozen dough balls into the oven and they came out perfectly! It was so awesome to be able to enjoy 2 warm, fresh cookies without taking the time to bake a whole batch, and this way I don’t have dozens of cookies left calling my name. Thanks SO much for sharing this recipe! That is so awesome!! I’ll try your freezer method next time I make them too-great tip!! I see that you used the coffee extract. I checked out the McCormick site and the rating is is 3 out of 5 stars. Could I just use some strong coffee or instant instead of wasting money on the extract and how much would you recommend? I have only made it with the coffee extract, sorry! You’d have to experiment a bit with it I think if you wanted to use regular coffee.